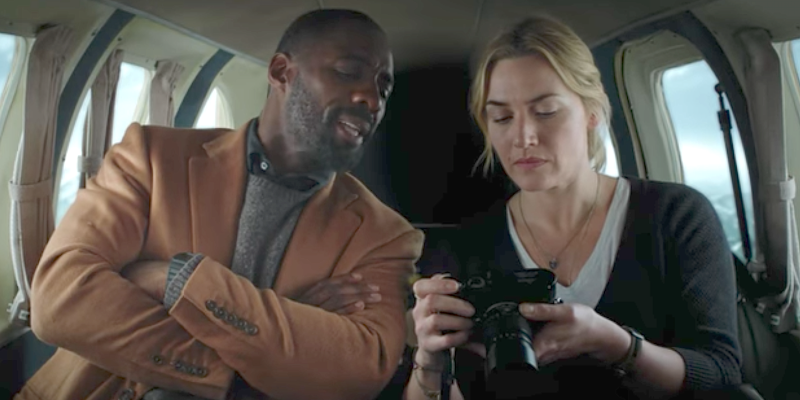 Alex (Kate Winslet), a photo-journalist for The Guardian, is desperate to catch a flight from Idaho to New York for her wedding the next day. Similarly Ben (Idris Elba) needs to get to Baltimore to perform an urgent surgery. When an incoming storm grounds all the flights the two band together and charter a small independent pilot (Beau Bridges) and his dog to take them part of the way. However, the flight goes awry and Ben and Alex find themselves stranded, injured and lost amidst the Uintas Mountains. With no hope of rescue, they must all work together if there is any hope of survival. I’m out of practise writing reviews. It’s been months since I’ve written anything other than an email or the blurb of a podcast, but I made a pledge during the recording of this week’s Lambcast (on Mission: Impossible – Fallout) that I’d post this review before that show went live, and dammit I’m trying. I sat staring at an empty WordPress page for a little while, struggling to work out how to begin a review once you get past the initial synopsis, and I figured instead of crawling around inside my own head exacerbating the cornucopia of crises already pinballing around in there I might be better off just writing this stream of consciousness down, hoping it free-wheels me into a direction for this review. I’m writing this overall piece because Kate Winslet starred in a movie, I watched that movie (eventually, I missed it in cinemas as it was released around Christmas and that’s a busy-old time for most people, myself included), and I once set a goal to review every Kate Winslet film. At one point I had achieved this goal, but then she went and made some more movies, and here we are. So why am I struggling to sink my teeth into this review? Perhaps it’s because this is a relatively underwhelming film. 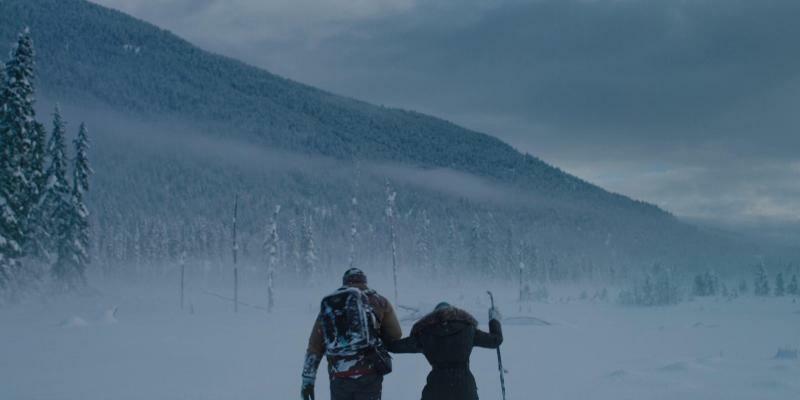 Winslet and Elba, two actors I enjoy but don’t obsessively love, get stuck up a mountain and must overcome numerous obstacles – including their feelings towards each other – in order to attempt to save themselves. It’s not exactly the most original concept in the world, is it? Not that everything needs to have a Charlie Kaufman script, but if you were handed this basic premise you could probably map out a decent portion of the plot without too much head-scratching. That being said, there are some innovative touches along the way. The cause and depiction of the plane’s inevitable yet entirely unscheduled descent was along the lines of something I’ve not seen in film before, with the crash being shown from entirely within the very cramped confines of the fuselage, and indeed prior to that some camera trickery provides the impression of one long take, allowing for character development along the journey. Alas the abrupt nature of the flight’s termination meant we had far less Beau Bridges than any film should have, but the little time he was on the screen was a delight. I also greatly enjoyed the antics of his surviving golden Labrador, who provided a joyous counterpoint to the occasionally otherwise negative outlook of some characters. 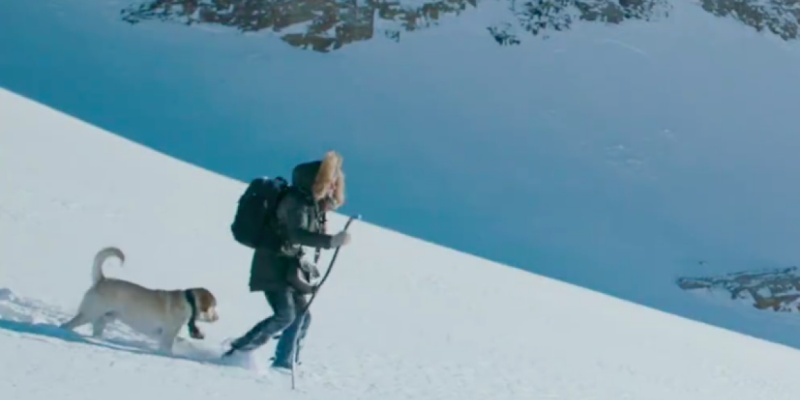 Whilst Elba and Winslet were at all times all too aware of the dire nature of their circumstances, clearly no-one had adequately conveyed the true extent of their predicament to the dog, who spent almost the entire film bounding around in nose-high snow, having the time of his life. Did it take me out of the film a little? Without a doubt. 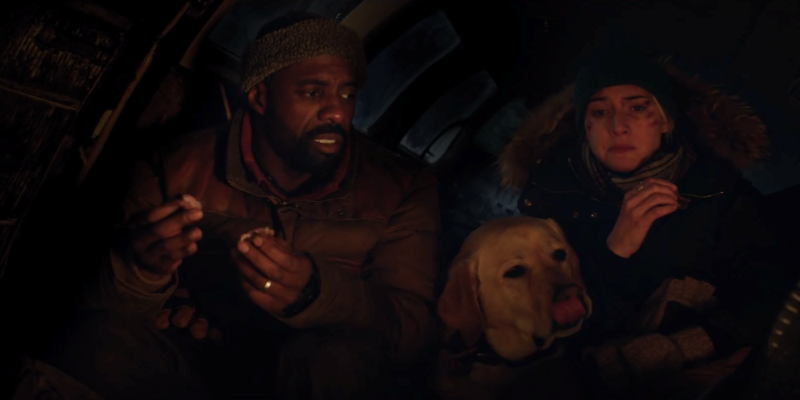 Did I enjoy the film far more than if the dog had not been present? Abso-frickin’-lutely. Speaking of Elba and Winslet, both are fine here, but I didn’t rate their chemistry with one another all that high. Given that for the majority of the film they are the story’s focal points, and how they interact with one another is probably the biggest story arc, you’d think that two actors would have been cast who could sell their relationship on screen, yet I never believed these two at any stage. The script surrounding them is also often not great (the rigid, logical Ben talks about how he’s a brain surgeon because the brain is the most difficult area to operate on, so the more reckless and emotional Alex replies “what about the heart?”), and the story moves at a relatively slow pace, especially given how soon into the film they are stranded and alone. 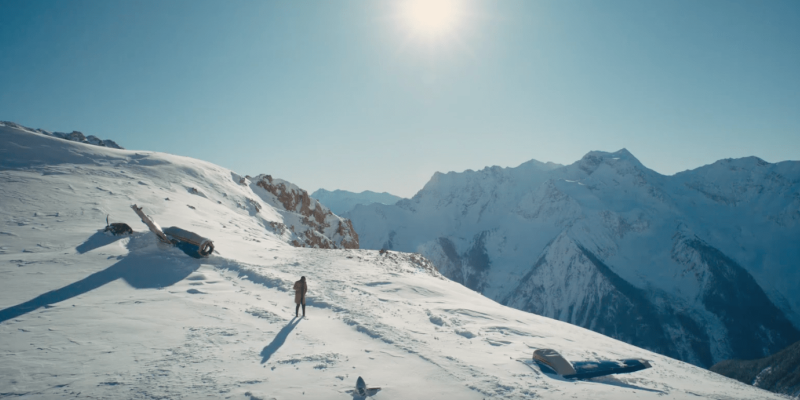 The scenery, on the other hand, looks stunning, and regularly dwarfs the actors with the sheer scale of the locations they find themselves in. Also, I greatly appreciated the final act, which took the film in an otherwise unexpected direction, and which set this apart from the run-of-the-mill genre flick I was expecting to watch. I feel I’ve been more negative than I’d originally intended within this review. To be fair, this isn’t a great film, but I did enjoy myself and I wasn’t bored. It’s not ground-breaking, you won’t really miss out on a great deal if you decide to skip it, but if you’re intrigued or can’t find anything else to watch, then give this a shot. It’s for films like this that I sometimes wish I had a middle option between Choose Film and Choose Life, but alas I do not, so given my criteria that a Choose Film ranking must make the time you spend watching the film more beneficial than doing something else, I guess this’ll have to fall on the Choose Life side, but only just. 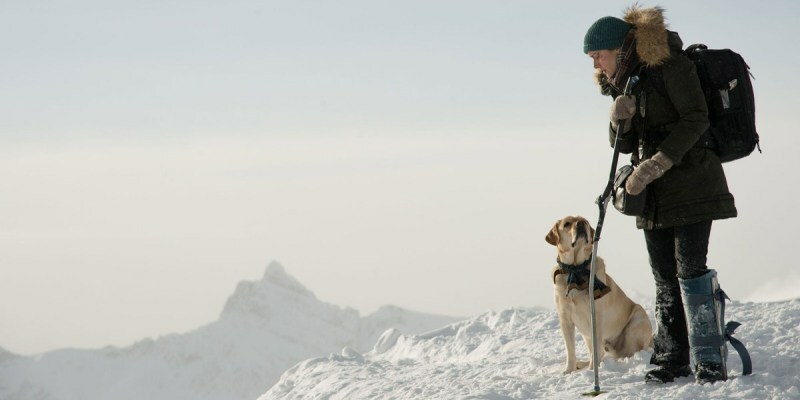 This entry was posted in 06/10, Choose Life, Film-Makers, Kate Winslet, Review and tagged Beau Bridges, Dermot Mulroney, Idris Elba, Kate Winslet, The Mountain Between Us by jaycluitt. Bookmark the permalink. Yeah, that’s pretty much how I feel about it. It’s just a big ball of meh. Yep, I picked a humdrum film to review for my return to blogging. I do really enjoy both actors but it seems like a major downfall if they don’t have great chemistry. It seems to be the type of movie that really depends on that to get you through it. 6/10 sounds about right based on your review. Yeah, given they’re the main draw and main focus, it was disappointing they didn’t light up the screen more together.